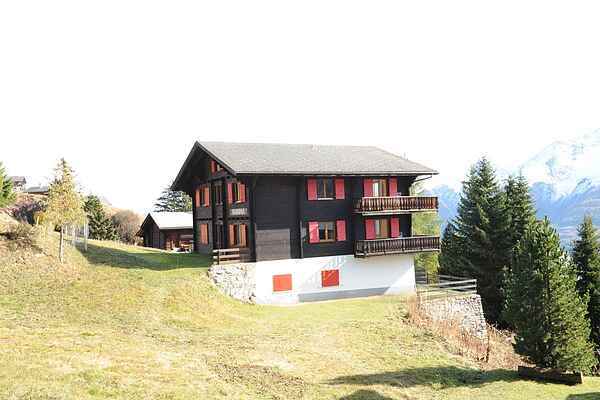 The Ramona house is up on the Riederalp, 5 minute's walk from the gondola station. You can park your car lower down the valley (CHF 7 per day) and use the Riederalpbahn to head up with your luggage. Up here, a lovely nature reserve with plenty of hiking opportunities awaits. You will be living on the ground floor of this spacious and comfortable apartment with a south-facing terrace and a magnificent view. The Riederalp, situated above the village of Morel, is 8km to the east of the town of Brig. You can find a 9-hole golf course, a wellness hotel with swimming pool, a tourist information office and a bank here. The house enjoys a stunning south-facing location. There are two holiday homes, one on the ground floor and one on the second floor, both with a south-facing terrace or balcony. Both homes have been carefully maintained and finished with plenty of wood. In the winter, you can ski from the house to the piste and back again. Particulars: On leaving the gondola station, you can find the luggage transports that can take you to your house.